And Robin Duska and Barbara Tuset have been successful in obtaining a National Audubon Plants for Birds Burke Grant to boost outreach to faith communities in Northern Virginia. This will be an Audubon at Home project in collaboration with the Plant NOVA Natives campaign led by Margaret Fisher. The key word in both of these is “collaboration” – the best way to accomplish our goals is by working with other like-minded organizations in our region, and these are good examples. We are very pleased that we will be awarding two scholarships to the Hog Island Educators Week program this year. We had a very successful Annual Appeal campaign this year, and your Board decided that offering a second scholarship this year would be an excellent use of funds. Along those lines, this is a reminder that the deadline for Conservation and Youth Education mini-grant applications is fast approaching – March 15. These are new programs, but they are already sparking a lot of interest. 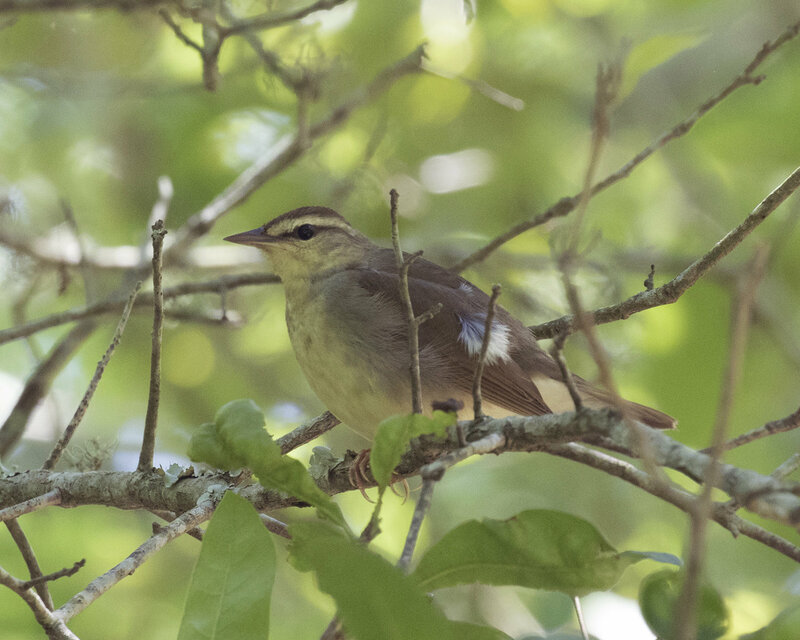 Don’t forget our upcoming Audubon Afternoon, on Sunday, March 11 with Sergio Harding speaking about current research on Golden-winged Warblers and Loggerhead Shrikes. And take a look at our workshops for the spring, including Beginning Birding by Ear, on March 31, and Bird Behavior. These are likely to fill up quickly. Faith communities take note! ASNV is pleased to announce that our Audubon at Home (AAH) Program has been awarded a $7500 grant from the Plants for Birds Burke Grant program, which has been established with generous support from the Coleman and Susan Burke Center for Native Plants. The goal of the Burke Grant program is to support network Plants for Birds activities that will increase the visibility, reach, and impact of Audubon’s Plants for Birds programming across the country. ASNV worked with the Friends of Dyke Marsh to obtain a National Audubon Society grant of $1,903 for native plant restoration at Dyke Marsh Wildlife Preserve. The funds have been transferred from ASNV to the Friends of Dyke Marsh to purchase native plants. Volunteers will install the plants this spring with the guidance of National Park Service scientists in a cleared area along the Haul Road. Let us know if you want to help! We will be running our Delaware Bay, shorebird, horseshoe crab weekend trip again this year, May 25-27. We will meet in Lewes, Delaware at the Beacon Motel parking lot at 3 PM on Friday the 25th and bird from then until dark at Cape Henlopen State Park. We will bird all day Saturday at several great places on the Delaware Bay that are famous for the Horseshoe Crab eggs that feed the migrating shorebirds including the threatened Red Knots. On Saturday we go to Broad Kill Beach Rd., Prime Hook NWR, Satellite Beach, Mispillion Lighthouse, Foster Beach etc. Then back to Lewes at dark with dinner on your own. Sunday morning we will check out and drive to Port Mahon and Bombay Hook NWR, further up the Delaware Bay. After those two places, we will have bag lunches, and do the check list at the picnic area at Bombay Hook, then head home probably around 2-3 PM. Arrangements have been made for a discounted group rate on 14 rooms at the Beacon Motel for the nights of May 25th and 26th. Trip reservations are needed and the limit is 20. Call or email Ray to sign up. Once you sign up then Audubon will contact you with instructions on how to pay the fee: $45 for members/$55 for non-members. Ray’s cell number is 571-286-7856. His email address is bluebird58@verizon.net. Ray will hold a shorebird identification class, and discuss the natural history of the Horseshoe Crabs on Friday night in the motel lobby for those who are interested after dinner, probably around 8 PM. Bring your Shorebirds 101, and The Horseshoe Crab handouts to the class. Ray will email them to you once you sign up so you can study in advance. Also remember to bring water, snacks, sunscreen, insect repellent and, of course, binoculars. Scopes will be very useful if you have them. This is also a great trip for photographers. The group will meet Friday evening, May 4th (hotel to be determined) with early starts on Saturday and Sunday mornings in search of our target birds. Once logistics are finalized, we will open up registration on the website. Trip will be limited to 15 participants. Put this on your calendar! Over a third of the 99 Audubon at Home Ambassadors gathered on February 17 for the third annual Ambassador Brunch at National Wildlife Federation headquarters, where ASNV also has its office. Sporting color-coded tags identifying their county, AAH Ambassadors from Arlington/City of Alexandria, Fairfax, Loudoun, and Prince William Counties mingled to share experiences and a delicious potluck meal. ASNV President Carl Kikuchi thanked Ambassadors for their work and told them how they are contributing to our observance of the “Year of the Bird.” New ASNV Program Administrator Louise Edsall introduced herself; we are thankful to have her support. 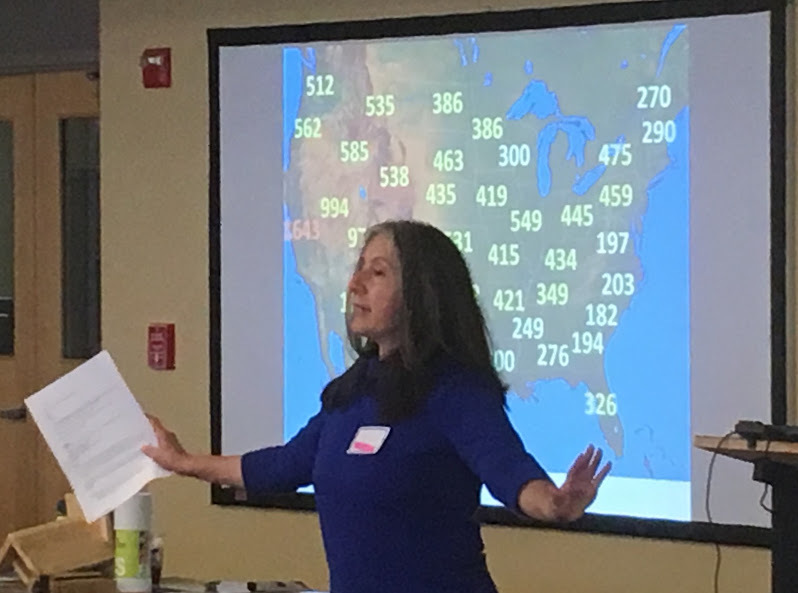 Co-Directors Barbara Tuset and Robin Duska outlined revamped program planning for AAH, including goals for habitat growth, volunteers, outreach, and administration. Updates from County Coordinators indicated continued AAH progress: For example, Arlington has expanded Ambassador ranks from their original Arlington Master Naturalist base to include several Master Gardeners to serve the many clients in this mostly urban county. To date, AAH has certified nearly 500 properties and 5,000 acres, with more than 250 visits in process. AAH is planning for a very busy 2018! The Virginia Conservation Network (VCN) and the Virginia League of Conservation Voters are working hard to advance sound conservation policies and block the problematic ones. To view VCN’s positions, visit vcnva.org/bill-tracker. At virginiageneralassembly.gov, you can find your legislators, track bills and watch the House and Senate live when they are in session. At the Virginia Public Access Project, you can search bills by issue, e.g., natural resources. If you put in the word “trees,” for example, six bills are listed. ASNVers may get some tips on how to advocate for stronger tree policies. You can learn more about the Fairfax County Tree Commission and county resources here. The Fairfax County Park Authority is extending the public comment period for the Lake Accotink Park master plan revision through May 28, 2018. FCPA presented lake management options to the community in May 2016 and held a January 22, 2018 community meeting, attended by more than 100 citizens. FCPA says that they have received more than 400 responses to an online survey and nearly 50 individual emails from citizens sharing their preferences and perspective. To share your views on lake management options, visit the Lake Accotink Park Master Plan Revision project webpage. You can also share additional comments through the survey page or send your comments separately to Parkmail@fairfaxcounty.gov. In the Trump administration’s infrastructure proposal, they propose selling the George Washington Memorial Parkway to the private sector, according to their February 12, 2018, Legislative Outline for Rebuilding Infrastructure in America. It is not clear if their proposal includes the entire GW Memorial Parkway park, places like the Dyke Marsh Wildlife Preserve, Theodore Roosevelt Island, Great Falls, Turkey Run, Arlington Cemetery, U.S. Marine Corps Memorial, the Women in Military Service for American Memorial, Jones Point Lighthouse and all the other lands and memorials of the parkway. Congress authorized the construction of the parkway as a memorial to the nation's first president. This “ribbon of green” in Northern Virginia is habitat for many wildlife species, helps stem storm water runoff and provides many environmental services, in addition to being a significant local road. National Audubon has prepared an analysis of how the proposed Trump budget will affect birds, other wildlife and habitat here. Local governments manage local parks, waste, land use, schools, development, stormwater control and more. Local governments are now considering their FY 2019 budgets and seeking input. Check your local government for the schedule on hearings, votes and opportunities to influence the budgets. Arlington, for example, will have a public hearing on April 3 and adopt the budget on April 21. Loudoun County’s Board of Supervisors will hold a hearing on March 3. The Migratory Bird Treaty Act, enacted in 1918, is credited with saving many species from extinction, such as the Wood Duck, Sandhill Crane, Snowy Egret and more. This law protects more than 1,000 species, most of which are not covered by other laws, while also allowing for the regulation of hunting. Celebrate finishing your taxes (or delay til Tuesday when they’re due) and join the Bauers on a bird walk to celebrate Spring. Sponsored by the Reston Association and The Bird Feeder of Reston. Explore this new area for walks with leader Phil Silas and check for arriving Spring birds in field and woodland habitat. Sponsored by the Northern Virginia Bird Club. Getting there: Address is between 15075 and 15077 Stillfield Place, Centreville. Take I-66 West to exit 52 and go right on Rte. 29 for about 1.25 miles. Turn right on Pleasant Valley Road. Proceed north for about 0.75 miles and turn right on Stillfield Place. Proceed about 0.7 miles to meeting place on the right. The lake and woods should be active with returning and nesting birds. Try this great location with the improved path and rebuilt dam. Toby Hardwick leads. Sponsored by ASNV. This park is a good place to look and listen for prairie and other warblers, as well as returning vireos. Jean Tatalias leads for the Northern Virginia Bird Club. This is a popular spring walk location in Reston along woods and streams. Sponsored by the Reston Association and The Bird Feeder of Reston.